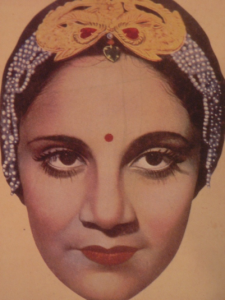 Born Ruby Myers in 1907 in Calcutta, and bursting onto the Silver Screen in the 1920s, Sulochana was the first female superstar of Indian cinema. She got her break when scouting out the location for a film called Telephone Girl. When the director cast his eyes on Ruby he was determined she was perfect for the role, even though she had no acting experience. Ruby had spellbinding beautiful eyes, and was thus given the stage name Sulochana which means “the one with the beautiful eyes”. 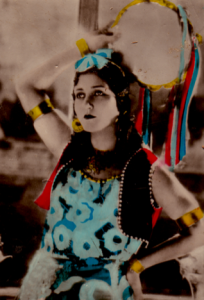 Sulochana was prolific, and many of her popular 1920s silent era films were remade as talkies in the 1930s and 1940s in which she also starred. A pioneer celebrity, Sulochana was reported to have the first Rolls Royce in India, and drawing on her star appeal even Gandhi used her images as part of his political campaigns. In 1973 Sulochana was conferred with India’s highest cinema award, the Dhabe Phalke Award for contribution to cinema. After her death in 1983 the Indian Government issued a stamp in her honour. 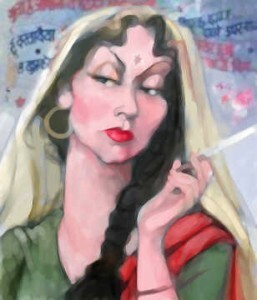 Rose Musleah was born in 1911 in Calcutta, where she was a dance teacher. It was after her divorce in the early 1930s that she decided to move to Bombay to start over by trying her luck in the burgeoning film industry. Rose quickly made the grade, and played a leading lady in many films. Her willingness to play modern women was a reflection of art imitating real life. A true socialite, during the 1940s her home in Bombay’s prestigious Marine Drive was a popular hangout and party venue for film stars, musicians and American military personnel. Around the time of Independence in the late 1940s Rose suffered a back injury which prevented her from acting for several months. At this time, Hindu and Islamic women also had begun taking up acting roles, no longer deemed taboo and Rose struggled to regain her place at the top of the billing. After an American airman proposed, she moved to America and settled into a new role as housewife in Los Angeles. 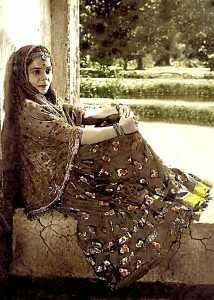 But she regularly returned to India to catch up with her film buddies and host her renowned parties. She passed away in 1985. Rose’s daughter Cynthia, and granddaughter and film editor Rachel Reuben, are interviewees in SHALOM BOLLYWOOD. Born Esther Victoria Abraham in 1916 in Calcutta, Esther was a teacher at the local Jewish school. Her fate changed when she went to Bombay to visit her cousin Rose. Rose was on set and the director was having a meltdown that none of the actresses were tall enough, when Rose pointed to her tall onlooking cousin and before you could say kosher pappadam, Esther was acting in film and given the stage name Pramila. Often playing the vamp, or bad girl, Pramila became the first Miss India in 1947 and acted until her final year, at the age of 90, in 2006. 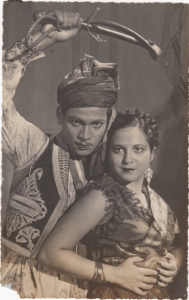 Pramila married the Muslim actor Kumar but their home was one of Jewish and Islamic coexistence, and her chicken soup a staple fixture on the family menu. Pramila’s son, actor and scriptwriter Haidar Ali, is an interviewee in SHALOM BOLLYWOOD. Born Farhat Ezekiel in 1932, Nadira established her place in Indian cinema history by playing the vamp in the 1955 classic SHREE 420, where her man chasing, drinking and gambling party girl roll was another case of life imitating art. With her fiery looks, admonishing style and darting eyes, Nadira set the benchmark for being a vamp and was a stalwart of the famous RK Studios where she was a close friend of the legendary Indian actor and director Raj Kapoor. Nadira was the last of the Indian Jewish cinema. Unlucky in love, after her death in 2006, she left many of her possessions to the local synagogue. Nadira’s good friend, Solomon Sopher, the leader of the Indian Jewish community, is an interviewee in SHALOM BOLLYWOOD. 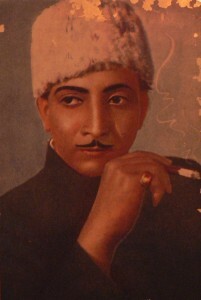 Born David Abraham Cheulkar in 1909, David’s family sent him off to law school, but amateur theatre had more allure than Law, and he went onto to try his hand at acting. Small in stature and bald, David was never going to get hero or villain rolls, but he mastered the art of character acting and in 1954 joined the pantheon of Indian cinema legends when cast by RK Studios in BOOT POLISH. A highly regarded raconteur, David regularly hosted the Indian equivalent of the Oscars. Actively Jewish, David visited Israel in his role as an Olympic weightlifting judge. He was at the Munich Olympics where his friend, the manager of the Israeli weightlifting team, was murdered in a Palestinian terrorist attack. David retired to Canada where he lived with family in Hamilton until he passed away in 1982. David’s niece and nephew, Victor and Dianne Abraham, whom he retired to live with in Canada, are interviewees in the film. As a documentary, it was impossible for our film to tell the story of every Jew who has worked in Bollywood. However, we feel it’s important to recognise the significant role and impact of two more female stars, Arati Devi AKA Rachel Sofaer and Ramola AKA Rachel Cohen. Arati Devi was highly respected for her films such as “Life Divine”, while Ramola was one of the biggest stars of the 1940s. While our documentary does not delve into their stories, they are an important part of the history of Jews and Indian cinema.